Grilled chicken or sirloin steak, fire roasted zucchini and fajita vegetables, broccoli, beans, corn, carrots, salsa and rice. It’s topped with poblano cream, cheeses, cojita cheese and cilantro. The fire roasted flavor in this dish delivers nicely. 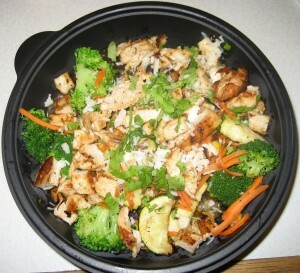 Although broccoli sounds like the odd veggie out…it played well with the other veggies in the bowl. We ordered this dish with chicken, and it was a little on the dry side. Also, the poblano cream didn’t add anything to the dish, so we added some salsa and creamy guacamole to it. Chicken or sirloin steak, fajita vegetables, three cheeses and mild ancho chile sauce and salsa in chipotle flour tortillas. Served with guacamole and sour cream on the side. This dish is unique because it is stuffed much more than a typical quesadilla. The fajita is soft, fresh, and bursting with so much flavor we didn’t even need any of the salsas. We ordered this dish with steak and it was pretty tender. 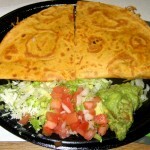 We were in awe of this quesadilla…this is not to be missed! Our only small gripe was that the bell pepper pieces were too large. Char-broiled chicken or steak, romaine lettuce, cotija cheese, tomatoes, avocado and tortilla strips topped with chili-lime salad dressing. We ordered this one with chicken and it was good, just a little on the dry side again. The chili-lime dressing is pretty good. This is a solid salad; a little plain but easily spruced up with a condiment from the salsa bar. The mango salsa and the fire-roasted salsa were up to par and added a little zing to this dish. Their salsas range from mild to wild! 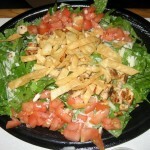 La Salsa is a fast-food type place where you order at the cashier station and wait for your number to be called. 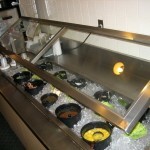 The drinks and salsa bar are self-serve and you have to bus your own tables. Therefore, there is not a lot to say about their service. However, the cashier was helpful and patient when we asked her questions about the menu and the food was ready in a timely manner. La salsa is a in small building that is adjacent to Austin’s Pizza. There is parking surrounding the building, so it isn’t an issue. There are plenty of tables – and even though we went during dinner it was quiet and not too crowded. The interior is clean, simple and brightly decorated. It’s hard to believe that there’s an eatery with fresh, affordable, and adequate food portions…Chipotle has some serious competition!